is used to represent the chain of Scottish islands named The Outer Hebrides (Western Isles). This archipelago is traditionally split between Inverness-shire and Ross-shire but as a far flung island group with a very distinct and clear history and culture, the inclination to adopt a flag of its own is obvious and typical of islands, which by their very nature are distinct and separate entities. The same sentiment prevailed in both Shetland and Orkney which were among the first localities in Great Britain to adopt specific local flags. The flag is basically an armorial banner formed from the shield on the council arms and is gold with a horizontal wavy blue and white band running across the middle. Above the band are two lymphads, locally termed “birlinns”, a seagoing vessel typical of the area, with another below. These are depicted with red penannts on the arms but are rendered all black on the commonly seen flag. who held the “the Lordship of the Isles“. Whilst the wavy blue and white bar is held to symbolise the sea, the whole design, featuring a main gold background colour and blue and white central band, is evidently derived from these earlier “Lordship” arms. Scottish heraldic law is very strict in dictating the terms of usage of arms and flags and there appears to be neither official sanction by the council for its armorial banner to be used by the public at large, nor, apparently, is the design registered by the Lord Lyon, Scotland’s highest heraldic authority, as the law dictates. 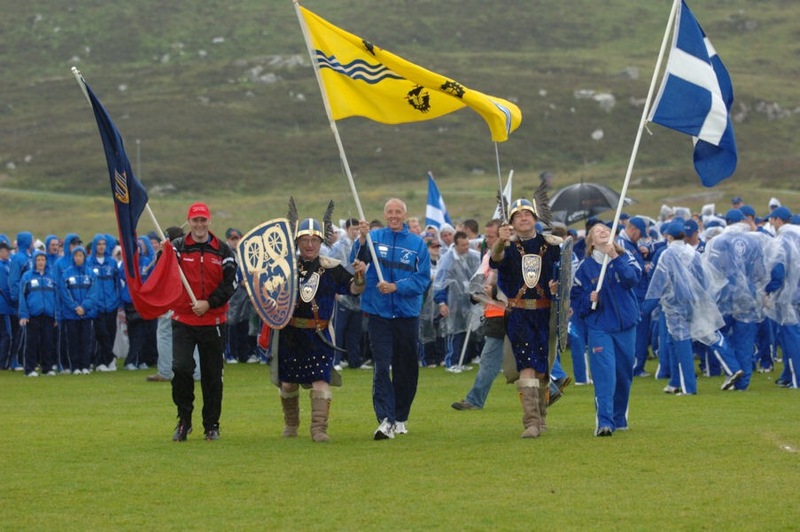 Nevertheless, it enjoys some popularity and is used to represent the archipelago by the Western Isles Island Games Association, when competing in Island Games competitions. features the Nordic cross pattern that is already found in the distinct flags borne by two of the islands, Barra and South Uist but in the familiar colour scheme of the council’s arms and comprises a white cross fimbriated (edged) in a dark blue shade, against a golden yellow background. A black “Birlinn”, typical of the local heraldry, as detailed, appears in the canton of the cross. This distinct and meaningful local charge, with its strong local heritage, merits retention in any new flag for the chain. This entry was posted in Inverness-shire, Ross (Ross-shire). Bookmark the permalink.